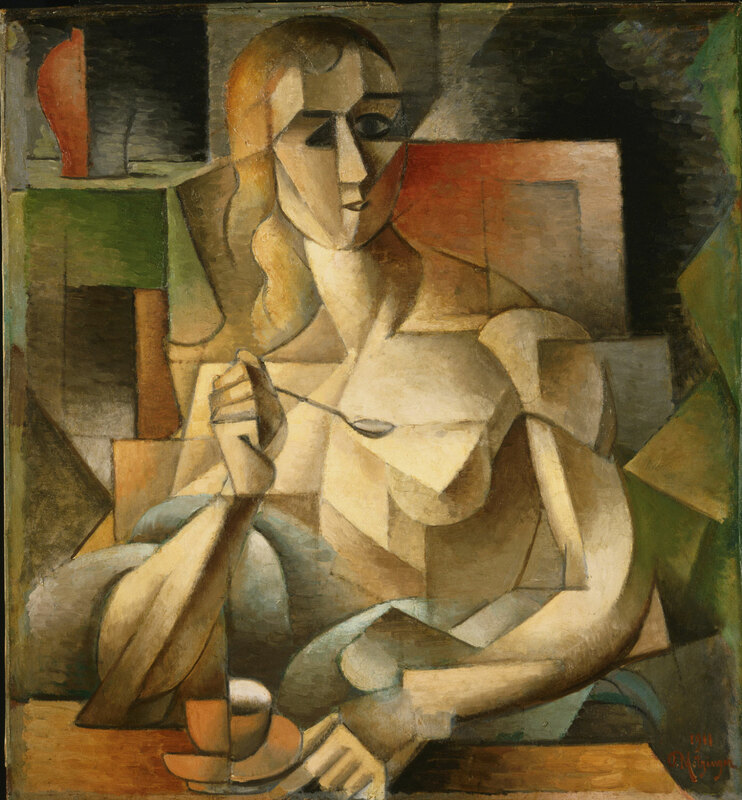 When this painting was first shown at the 1911 Salon d’Automne in Paris, the prominent art critic André Salmon dubbed it “The Mona Lisa of Cubism.” While Pablo Picasso and Georges Braque were moving even further toward the dematerialization of the figure in their canvases of 1911, Metzinger remained resolutely committed to legibility in Tea Time, where a seated woman, holding a teaspoon suspended between cup and mouth, is clearly discernible within a geometric environment. The artist does, however, show the teacup in profile and from above to demonstrate the new art’s mobile perspectives. R. Auclair, Paris, in 1912 . Possibly Pierre Faure, Paris, by 1930 . Unidentified dealer, c. 1936; sold to Louise and Walter C. Arensberg, Los Angeles, through Marcel Duchamp as agent, 1936 ; gift to PMA, 1950. 1. A. Gleizes and J. Metzinger, Du cubisme, Paris, 1912, repro. (as exhibition Salon d'Automne; collection M[onsieur] R. Auclair); G. Apollinaire, Les peintres cubistes, Paris, 1913, repro. (same information). "R. Auclair" may be a pseudonym. 2. A painting by Metzinger entitled "Le goûter" ("Le goûter" was the title by which "Tea Time" was commonly known in its earlier history) was lent by Faure for exhibition at de Hauke & Co., NY, in April 1930. The dimensions listed in the de Hauke & Co. exhibition logbook, 29 1/2 x 27 3/4 in., match the PMA painting closely. See Archives of American Art, Jacques Seligmann & Co. Records / Series 9.4 / Box 406 / f. 8/ De Hauke & Co., Inc. Records/ Exhibition Files: Logbooks, 1930-1932 (copy in curatorial file). The "Créateurs de cubisme" (Beaux-Arts, Paris, 1935, catalog by Raymond Cogniat), also lists a painting, no. 136, entitled "Le goûter," belonging to Pierre Faure. Faure may have purchased the painting through Léonce Rosenberg, his usual dealer. However, this painting is dated 1912, while the Arensberg painting is inscribed with the date 1911. In addition, the Faure painting measurements are given as 68 x 68 cm., while the Arensberg painting is rectangular, measuring 75.9 x 70.2 cm. 3. Duchamp's provenance notes dated September 8, 1951, record that it was purchased "from dealer, 1936", probably a Paris dealer, as most of Duchamp's purchases were made there (PMA, Arensberg Archives).